Anti-icing is a strategy (when done properly) keeps the bond between ice and the pavement surface from forming. It involves applying ice control chemicals before, or at the start of a snow event. Using this strategy often reduces total chemical use and allows a higher level of service to those who utilize a given site. Some studies done (Wisconsin is one state which is very pro-active in studying the effects of various anti-icing and deicing techniques) show that anti-icing produces equal or better surface conditions along with less actual chemical use. It has been reported the residual effects can be noticed for several days. Now – if the precipitation (snow or freezing rain) continues in earnest, the accumulation might get ahead of your efforts to control the bond forming process. Heavy rain, freezing rain, or intense snowfall rates can negate the desired effects of anti-icing. 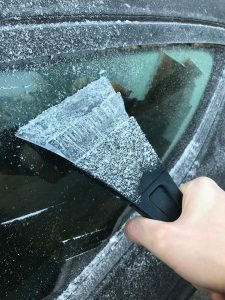 If this occurs, you should switch to a normal deicing approach to accomplish desired results.